Updated Guide for Bitcoin Mainnet! I like to tinker and build stuff myself. Recently I built my own Bitcoin / Lightning Node with a simple Raspberry Pi. It took several iterations to get it right and it taught me a lot. This is my attempt to share my learnings and encourage you to run a node yourself. Why am I excited about Bitcoin and Lightning? Bitcoin as a new technology is an incredibly interesting endeavor, especially because of its interdisciplinary nature. Bitcoin as sound money is going to have a major impact on economic principles and thus society as a whole. In my opinion, a solid, anti-fragile base layer for this future monetary network will be more important than the most novel feature of competing projects. Due to network effects, I can only see one major monetary blockchain — Bitcoin — evolving over time. At the moment, Bitcoin is more of a store of value and not really suited for small everyday transactions. Due to limitations of the blockchain and the incredible growth of its usage, fees have risen and business models relying on cheap transactions are being priced out. This is fine. Truly decentralized blockchains are a scarce resource and cannot scale to accommodate all global transactions. The current scaling pains are a great motivator to build better technology to scale exponentially, as opposed to just making everything bigger for linear scaling. This is where the Lightning Network comes in. As one of several new blockchain “extensions”, its promise is to accommodate nearly unlimited transactions, with instant confirmation, minimal fees and increased privacy. It sounds almost too good to be true, but in contrast to ubiquitous ICO with their own token, this technology is well researched, committed to the cypherpunk open-source ethos and leverages the solid underpinnings of Bitcoin. To preserve the decentralized nature of this monetary system, I think it is important that everybody can run their own trustless Bitcoin node, preferably on cheap hardware like a Raspberry Pi. This is why I set out to run my RaspiBolt and think that I have now — through numerous iterations — quite a good configuration, that I would like to share as my modest contribution to the community. I am not a system specialist, so please feel free to point out improvements in the comments. This server is set up without graphical user interface and is used remotely using the Secure Shell (SSH) command line. In the future, this server should function as my personal backend for desktop and mobile wallets, but I haven’t found a good solution to this yet. So, command line it is for the moment. As all components of the Lightning network are still under development, this server is configured for the Bitcoin Testnet. The plan is to regularly update this guide until we hit the mainnet once there is an official and stable Eclair Lightning release available for that. A switch to the mainnet will be straightforward. This guide strives to give simple and foolproof instructions. But the goal is also to do everything ourselves, no shortcuts that involve trust in a 3rd party allowed. This makes this guide quite technical, but I try to make it as straightforward as possible and explain everything for you to gain a basic understanding of the how and why. I used a Raspberry Pi 3 Model B, which is a bit faster than the Pi 2 and has built-in Wifi, and set it up with a 8 GB SD card. To run a Lightning node, the full Bitcoin blockchain must be stored locally, which is ~200 GB and growing. I bought a cheap hard disk enclosure and reused an old 500 GB hard disk that was lying around. I use two power adapters: an old 5v USB mobile phone charger with 1A, and the separate power supply of the hard disk enclosure, as the USB ports of the Raspberry Pi cannot provide enough power to run an external hard disk directly. You will need several passwords and I find it easiest to write them all down in the beginning, instead of bumping into them throughout the guide. They should be unique and very secure, at least 12 characters in length. Do not use uncommon special characters, blanks or quotes (‘ or “). Store a copy of your passwords somewhere safe (preferably in a password manager like KeePass or LastPast) and keep your original notes out of sight once your system is up and running. The node runs headless, without keyboard or display, so the operating system Raspbian Stretch Lite is used. Download the Zip file and follow the installation guide on the Raspberry Pi website. As no direct interaction with the Pi is possible during the initial setup, the remote SSH connection needs to be enabled beforehand. After writing the image to the Micro SD card, create an empty file called “ssh” (without extension) on the main directory of the card, so SSH will be enabled from the start. The SD card can now be inserted into the Pi. Replace [WIFI_SSID] and [WIFI_PASSWORD] for your own WiFi. Note: if you connect via network cable, you can also configure the Wifi later. For the initial setup, the Pi needs to be connected to the home network using a network cable (it can run on Wifi later). With the SD card inserted and a network cable plugged in, start the Pi by connecting it to the mobile phone charger using the Micro USB cable. The node is starting and getting a new address from your home network. This address can change over time. To make the Pi reachable from the internet, we assign it a fixed address. 👉 additional information: accessing your router. Now open your web browser and access your router by entering the address, like a regular web address. You need so sign in, and now you can look up all network clients in your home network. One of these should be listed as “raspberrypi”, together with its address (eg. “192.168.0.240”). 👉 don’t know your router password? Try routerpasswords.com. ⚠️ If your router still uses the initial password: change it! We now need to set the fixed (static) IP address for the Pi. Normally, you can find this setting under “DHCP server”. The manual address should be the same as the current address, just change the last part to a lower number (e.g. 192.168.0.240 → 192.168.0.20). 👉 additional information: setting up port forwarding. Save and apply these router settings, we will check them later. Disconnect the Pi from the power supply, wait a few seconds, and plug it in again. The node should now get the new fixed IP address. If you are using Windows and the PuTTY / KiTTY client, you can copy text from the shell by selecting it with your mouse (no need to click anything), and paste stuff at the cursor position with a right-click anywhere in the ssh window. 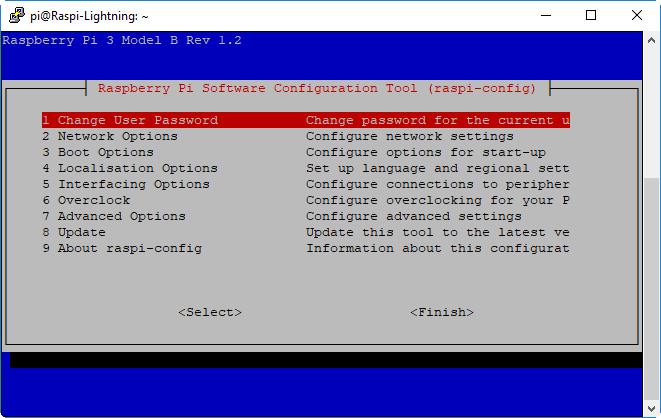 Accept the server authentication and log in with the username “pi” and password “raspberry”. First, with (1) change your password to your password [A]. Do this regularly every few months to get security related updates. The usage of a swap file can degrade your SD card very quickly. Therefore, we will disable it completely. Bitcoin Core will run in the background (as a daemon) and use the separate user “bitcoin” for security reasons. This user does not have admin rights and cannot change the system configuration. Enter the following command, set your password [C] and confirm all questions with the enter/return key. And while you’re at it, change the password of the “root” admin user to your password [B]. The external hard disk is attached to the file system and can be accessed as a regular folder (this is called “mounting”). The hard disk should be empty and formatted. Mount all drives, view mounted partitions. Is “/mnt/hdd” listed? Navigate to the hard disk and create the directory for Bitcoin testnet. If this command gives you an error, chances are that your external hard disk is mounted as “read only”. Several readers had issues with that. This must be fixed before proceeding. Please note that we mounted using umask=002,gid=bitcoin, which gives only the user “bitcoin” write access. User “pi” can only read and must use sudo when writing to the disk. 👉 If your drive is “read-only”, let me know on reddit. As soon as I figure a way to provide an easy, generic approach, I’ll update this guide. The following steps need admin privileges and must be executed logged in as the user “pi”. The Pi will be visible from the internet and therefore needs to be secured against attacks. A firewall controls what traffic is permitted and closes possible security holes. 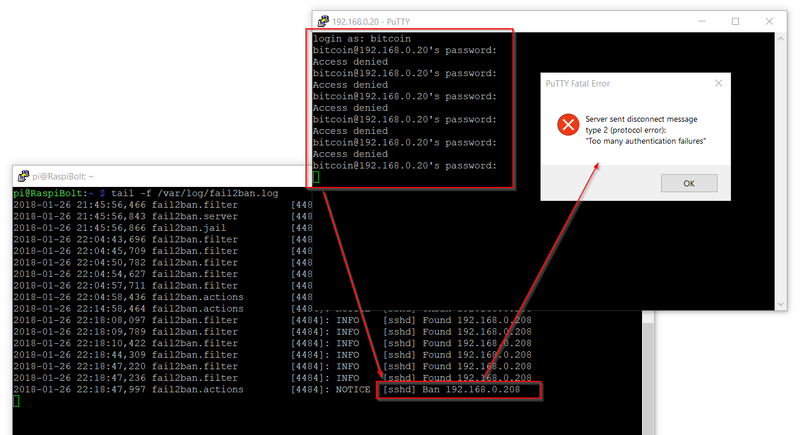 The line ufw allow from 192.168.0.0/24 … below assumes that the IP address of your Pi is something like 192.168.0.?? ?, the ??? being any number from 0 to 255. If your IP address is 12.34.56.78, you must adapt this line to ufw allow from 12.34.56.0/24 …. The SSH login to the Pi must be especially protected. The firewall blocks all login attempts from outside your network, but additional steps should be taken to prevent an attacker — maybe from inside your network — to just try out all possible password. The first measure is to install “fail2ban”, a service that cuts off any system with five failed login attempts for ten minutes. This makes a brute-force attack unfeasible, as it would simply take too long. The initial configuration should be fine as it is enabled for SSH by default. If you want to dive deeper, you can 👉 customize the configuration. 👉 This is an advanced measure, but I think a must at least for the Bitcoin mainnet. If you would like to try, please find additional information on the follow-up Getting ready for ️Lightning on Bitcoin Mainnet. The base of the Lightning node is a fully trustless Bitcoin Core node. It downloads all blocks since the Bitcoin Genesis block to rebuild the complete blockchain, validates all blocks and creates an index with all transactions that ever happened. By doing all this work ourselves, nobody else needs to be trusted. We will download the software manually from bitcoin.org and verify its signature to make sure we use an official release. We download the latest Bitcoin Core binaries (the application) and compare the file with the signed checksum. This is a precaution to make sure that this is an official release and not a malicious version trying to steal our money. Extract the Bitcoin Core binaries, install them and check the version. Change to user “bitcoin” and enter the password. We add a symbolic link that points to the external hard disk. Navigate to the home directory and check the symbolic link. The content of this directory will actually be on the external hard disk. Now, the configuration file for bitcoind needs to be created. You can copy the next block directly into your SSH client. In PuTTY, just click the right mouse button, in a terminal window in Linux or Mac it usually is Ctrl+Shift+V . ⚠️ Change rpcpassword to your secure password [E], otherwise your funds might get stolen. Create the configuration file in the Nano text editor and copy the following paragraph. Save Ctrl+O and exit Ctrl+X. After rebooting, the bitcoind should start and begin to sync and validate the Bitcoin blockchain. Wait a bit, reconnect via SSH and login with the user “bitcoin”. Use the Bitcoin Core client “bitcoin-cli” to get the current progress of the blockchain validation. Note: only the user “bitcoin” can use “bitcoin-cli”! When “bitcoind” is still starting, you may get an error message like “verifying blocks”. That’s normal, just give it a few minutes. Among other infos, the “verificationprogress” is shown. Once this value reaches 1 (or 0.99999…), the blockchain is up-to-date and fully validated. The validation of the testnet blockchain will take several hours, mainnet would take more more than a week. This is why I’ll provide a guide on how to download and verify the main blockchain on a regular computer and then copy it to the Pi. Personally, I keep only a small amount of bitcoin in a wallet that is connected to the internet, like change in a purse. Most bitcoin is in cold storage, where using a hardware wallet is a very convenient but secure solution. That said, never put more bitcoin than necessary in the wallet on the Pi. 👉 Check out Ledger and Trezor for highly recommended hardware wallets. Now, we create a backup of the wallet and restore it. If your wallet is locked, you need to unlock it (with walletpassphrase)before restoring it. Store a backup copy of the “wallet.backup” file somewhere save. After the initial sync, you can shut down the Pi, connect the hard disk to your desktop computer and copy the backup file. As long as you used a really strong password, the backup file reveals no sensitive information. Want to get “testnet” rich? Let’s create a Bitcoin address and get some testnet Bitcoins from a faucet. On your desktop computer, go to the following website, paste the address and get some coins! Check your wallet balance: you should see the incoming coins in “unconfirmed balance”. Wait until your coins are shown in “balance” before proceeding. This means that your incoming transaction is now confirmed by a miner and written to the blockchain. On testnet, the funds in your Bitcoin Core wallet need to be held in a special address type. We create such an address and transfer the whole balance of your wallet. Create a new Bitcoin transaction that sends your balance [A] to the new witness address [C]. You get the transaction id [D]. 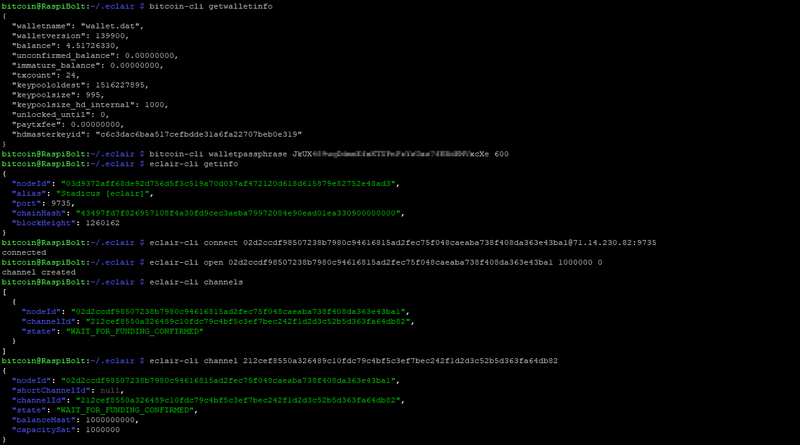 To check the transaction, look the transaction id [D] up in a Bitcoin Testnet Blockchain Explorer. After some time, a bitcoin miner will pick up the transaction and add it to a new block. If everything seems to run smoothly, and now you have some bitcoin to use, this is the perfect time to familiarize yourself with Bitcoin Core and play around with bitcoin-cli until the blockchain is up-to-date. A great point to start is the book “Mastering Bitcoin” by Andreas Antonopoulos — which is open source — and in this regard especially chapter 3 (ignore the first part how to compile from source code). Once the blockchain is synced, the Lightning node can be set up. 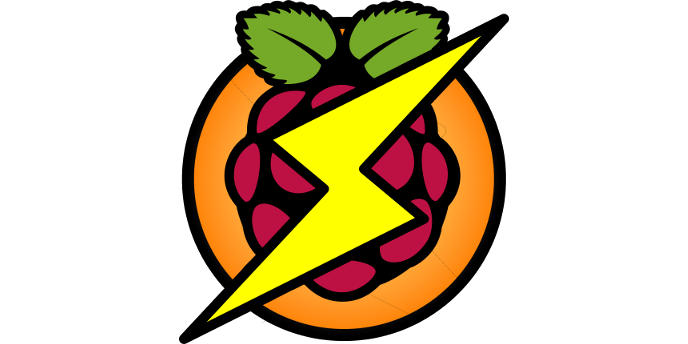 This Pi uses the Acinq Eclair Lightning node. The reason for choosing Eclair is that it runs in the Java virtual machine and must not be compiled especially for the Raspberry Pi. The source code is very clean and support is great. Still, it’s Alpha software and bugs are to be expected. Log in as “pi”, as only this user has admin rights. First, we install Java and JQ and check if the program runs correctly. If you upgrade from a previous version of Eclair, stop the service and remove the old files first. Now, download the binary files from GitHub. Please check the Releases page for current download links. The “eclair-cli” client script needs to be installed. Open the file “.bashrc” in Nano. Add the following line at the end, save and exit (see above examples). For convenience, we add password [F] to the client script. Save & exit. $ exit to get back to your original session. Create the eclair configuration file with the following content. Replace YOURNAME with any public alias you like (I use Stadicus). Enter the two passwords where suggested. The passwords must be be enclosed by double quotes (“…”) and should not contain quotes or spaces. Make sure that the rpcuser and rpcpassword in “bitcoin.conf” and “eclair.conf” match exactly, otherwise Eclair will fail on startup. If you want people to connect to your node, remove the # in front of “eclair.server.public-ips” and enter your real IP address. The Eclair Lightning node will also run as a daemon, started by systemd, but only after “bitcoind.service” has been started. You can observe the operations of Eclair by streaming the log file. You are now all set to interact with your Lightning Node! Use eclair-cli to query your node, open channels and make payments. The following screens describe how to kickstart your node from the first connection to the first payment. 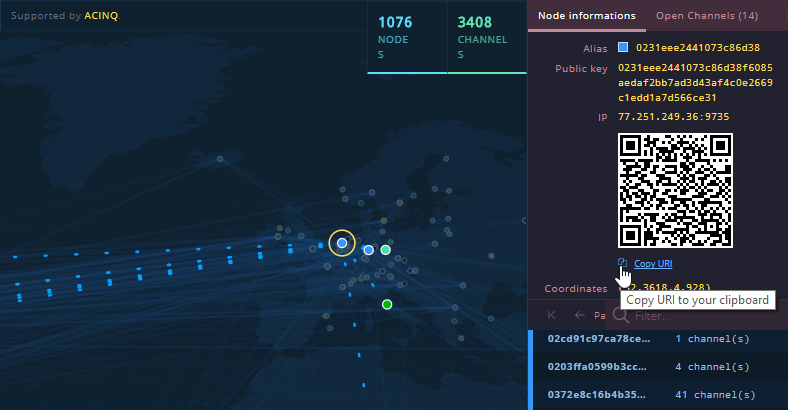 To open a channel, go to the Lightning Network Explorer and just pick a node with a public IP address, copy the URI and use with the “connect” command. Please note, that the “connect” commands needs the URI (NodeID@IP:Port), while the “open” command needs just the NodeID. And as you need to spend some bitcoin to open a channel, you need to unlock your Bitcoin Core wallet first! There is no clear error message if it’s locked. Make sure that you are using user “bitcoin” for the following commands. Expect the “connect” command to fail quite often, as many listed nodes are offline and cannot accept the request. Repeat the channel creation to open a few channels. Feel free to connect to my node! The funds to open the channel are now transmitted on the Bitcoin blockchain and need to be confirmed by miners. This can take up to 2 hours. After the channel has reached the status “Normal”, you can try and spend some coins on Y’alls or Starblocks with $ eclair-cli send [PaymentReq]. Et voilà, your freshly brewed Blockaccino! So this is it! Did you like my guide? Do you have questions or improvments proposals? Let me know in the comments, on reddit or on Twitter (@Stadicus3000)!